The late Ron Wyatt is noted for his fabulous claims to have located just about every secret thing there is, including Noah’s Ark, the location of Sodom and Gomorrah and the other cities of the plain, Mount Sinai, the location of the crossing of the Red Sea, wheels from Pharaoh’s chariots, the ashes of the red heifer, the ark of the covenant, etc., etc., etc. Standish and Standish, two Seventh Day Adventist researchers, wrote a response to Wyatt, who was also a Seventh Day Adventist. In Holy Relics or Revelation, they give a list of 92 things Wyatt claimed to have found. This book is available at Amazon, and is partially available online at Google Books. Ron Wyatt (1933-1999) was a nurse-anesthetist with no training in archaeology. We might more correctly call him an explorer. Few famous, recognized archaeologists have more than one or two fabulous finds to their credit, but Wyatt found almost everything that was missing! Typically I receive several Emails each year asking about some of the claims of Wyatt, though they do not always mention his name. Recently I received a PowerPoint presentation attached to the Email. The presentation is entitled “Moses & the Red Sea Crossing Truth or Fiction?” Of course, I believe Moses led the developing nation of Israel through the sea. No one takes credit for producing the presentation. There is no documentation other than Scripture references. Looking at the “Properties” of the presentation that someone borrowed a template from some other presentation. The presentation includes a map showing Succoth immediately north of the Gulf of Suez. That is the wrong position. Israel then traveled across the Sinai peninsula through a wadi running east toward Eilat/Aqaba, then southerly to Nuweiba on the Gulf of Aqaba (Eilat). This, according to Wyatt, is exactly where the Israelites crossed the Red Sea out of Egypt (he considered the Sinai peninsula as Egypt) into the wilderness on the east of the Gulf of Aqaba. This is necessary to place Mount Sinai in Saudi Arabia. Wyatt did some scuba diving and found Pharaoh’s chariot wheels, chariot bodies, human and horse bones. 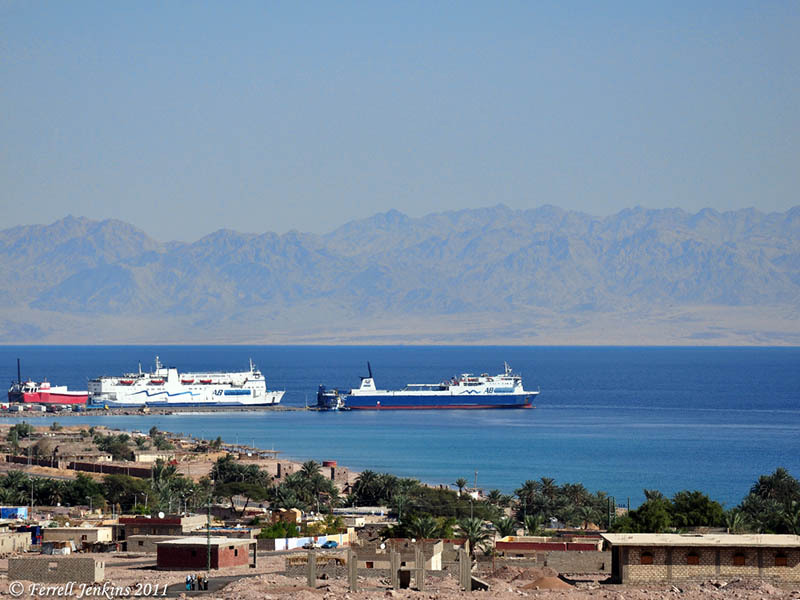 The photo below is one I took in the vicinity of Nuweiba January 26, 2011. The view is east from the Sinai Peninsula to Saudi Arabia. This point is about 160 miles on a straight line from where the presentation map shows Israel leaving Succoth. It is about 45 miles south of Eilat/Aqaba. Eilat is in Israel; Aqaba is in Jordan. Even the modern roads in the Sinai are not built on a straight line. Think about it. A large, powerful, professional Egyptian army had to chase “about six hundred thousand men on foot, aside from children” (Exodus 12:37-38). The Israelites also had their “flocks and herds” and “a very large number of livestock” with them. Yet, the Egyptians could not catch them for more than 160 miles! View from Sinai Peninsula east to Saudi Arabia. Photo by Ferrell Jenkins. I don’t have the time now to do more, but I have located some articles that raise serious questions about Wyatt’s claims. Wyatt was never taken seriously by archaeologists (whether conservative or liberal). Indeed there are at least ten different proposals for the location of the Red Sea or Reed Sea — including three lakes near the Mediterranean Sea, five lakes along the line of the present-day Suez Canal, as well as the Gulf of Suez and the Gulf of Elath. In addition, there are at least twelve different candidates for Mount Sinai: five in the southern part of the peninsula, four in the north, one in the center, one in Midian (Saudi Arabia), and another in Edom (southern Transjordan). (Zondervan Atlas of the Bible, Rev. Ed., 103). Wyatt was a Seventh Day Adventist, but when he was actively making his claims several Seventh Day Adventists scholars took up pen to respond to him. We have already mentioned the book by Standish and Standish. Who am I and why have I opened this Web site? He explains something about his credentials and states that he has been asked these questions “over and over again.” His comments were last updated in 2006. Ark of the Covenant, has it been found? Did the Israelites cross the Red Sea or the Gulf of Aqaba? This is the specific question that we are now discussing. You may find Dr. Merling’s material here. The page dealing with the question of the Red Sea crossing includes maps showing the difference between what the Bible says and what Wyatt claimed. There is also a photo of the column that Wyatt claims is from the time of Solomon. Merling shows that it is from the time of Jesus [Roman], and unlike columns from the time of Solomon. In another post we will mention more material responding to Wyatt and other pseudo-archaeologists. This entry was posted in Archaeology, Bible Places, Bible Study, Egypt, Israel, Old Testament. Bookmark the permalink. To question where the “Red Sea” crossing is at is foolish. Scripture tells us God brought darkness down on the Egyptians to slow them down when chasing the fleeing Isrealites. Yeh, horses pulling chariots are a lot faster than 2 million people walking, with flocks and livestock. God delivered these people, and God allowed the Egyptians to chase them into the Red Sea and God allowed them to drown. Why? To show that He was / is in control and God made the wicked for the day of destruction, that is why He drowned them. To argue these stupid little details of horses are faster than people walking and the Gulf of Aqaba is not the Red Sea, read scripture and not just what you want to hear, take it all in, use it in context to the facts of the area and story, it will make perfect sense. God uses many people, whether they are for Him or against Him. If you don’t believe horses drowned and wheels fell off chariots, so be it, it is your choice. But Ron Wyatt found some amazing things which explained a lot, he may not have had some initials before or after his name, but he made sense in his acclaimation and presentation of facts. Choose your side, God’s wisdom or man’s wisdom, commit to one or the other, but be careful who you choose. The being who spoke all this into existence will ask you “Were you for me or against me”, then you will need proof of such, one day we will all give an account, chose careful. Ourbothy. Thanks. I certainly think there is a place for apologetics. I don’t think that incorrect information is a good foundation for a firm faith. Carl. Thanks for the note. I had already prepared some notes about Gordon’s material, but had to leave to spend some time with our grandson before I could post it. jimsda. Thanks for your comment. My response has nothing to do with any doctrines of the SDA. I think the materials lacks biblical, geographical, and archaeological credibility. facts, each party wants to be right. But I say the veracity of the biblical story is not altered by this kind of discovery. I also received this file em@il and I will not use it to certify Word of God. 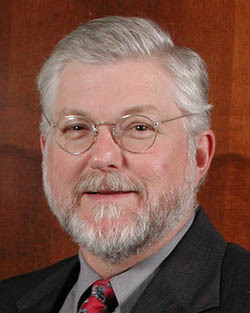 A series of refutations of Wyatt’s views are available at Gordon Franz’s Life and Land Seminars web site. Thank you for speaking out about these fantastic claims. All of us would want these discoveries to be made, as it would help others to see the truthfullness of God’s word. But when the claims such as those made by Ron Wyatt are later found to be false, it actually causes others to doubt the truthfullness of God’s word. Wyatt probably thought that he was helping to bring people to a saving knowledge while building his ego at the same time but I think he has done more harm than good.